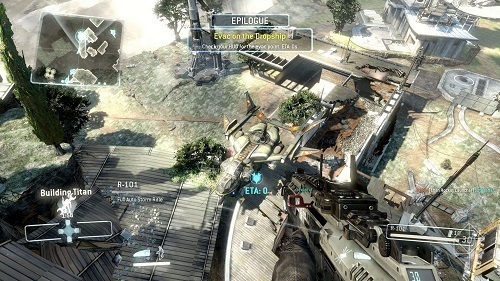 Titanfall is a first person shooter for Windows, Xbox 360 and Xbox One that pushes the genre into a different direction by introducing large mechanical machines into the combat environment. With plenty of variety in the gameplay this 2014 addition to the FPS genre sets a new standard. 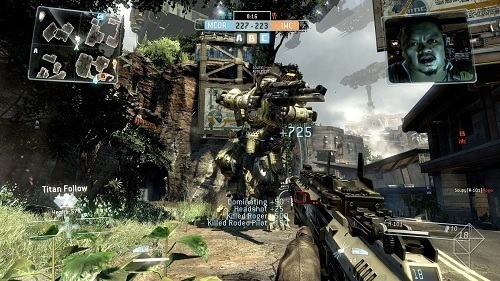 In Titanfall players have the option to roam the map on foot or jump into a mechanical fighter known as a Titan. Every Titanfall match pits teams of two players against each other as they battle to complete various team based objectives with various weapons and Titans at their disposal. The game is all about the fast paced experience and lets players quickly move around the map and even throws in some parkour style features as players run on walls, double jump and gain speed quickly as they sprint forward onto battle. Titans are also very fast and only slightly slower than players outside of the mechanical giants. Players won’t just be battling other players though and instead be joined on the battlefield by plenty of AI controlled soldiers. This ensures that when you do get to hop into your Titan that you have plenty of enemies to mow down for a satisfying experience but doesn’t leave countless players on the other side becoming frustrated. It’s a balance that means you’ll have less volatility in the online experience and results in a generally more enjoyable offering. With plenty of abilities to give you a tactical edge in Titanfall players have plenty of room to customise their pilot’s abilities and weapons. Abilities include cloaking, speed boosts and even x-ray vision while weapons are a mostly standard offering with assault rifles, machin guns, sniper rifles and plenty of anti-Titan weapons. Titans have a similar level of customisation to ensure that all play styles can create something that they feel comfortable with. Titans are split into three classes (light, medium and heavy) which change the level of armour and speed available to each one. The real customisation comes from the Titan’s powers though from the ability to stop enemy bullets midair to blocking all damage with a temporary shield and many others. Titanfall redefines the first person shooter genre to create an experience that any fan of multiplayer shooters will instantly become hooked on. Reinvents the first person shooter genre. Battle on foot and in huge mechanical vehicles (Titans). Plenty of room to customise your pilot and Titan. Huge battles with the help of AI controlled fighters. On Windows, Xbox 360 and Xbox One.